The Truly Simple Manifesto is the beginning of something great. I hope. Its the start of something new. Something simple. TrulySimple is here to help explore the ideas of a Truly Simple lifestyle. Of getting back to basics and finding the simple way to live. The Manifesto kicks that off and explores 3 core concepts that are central to this theme. They are: Don’t Worry, Live Simply, and Love Others. Thats it. Simple huh? Thats the idea. If you like what you read, please pass this along to someone you know who might also like it. Together we can find that simple way to live and be happy. 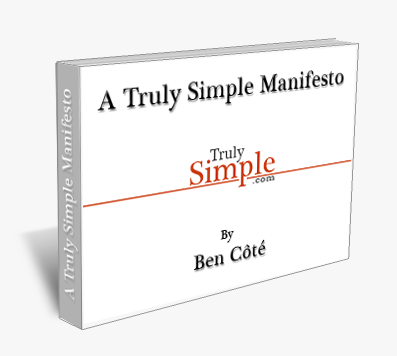 Please leave a comment below and let me know what you think of the ideas discussed within the Truly Simple Manifesto.